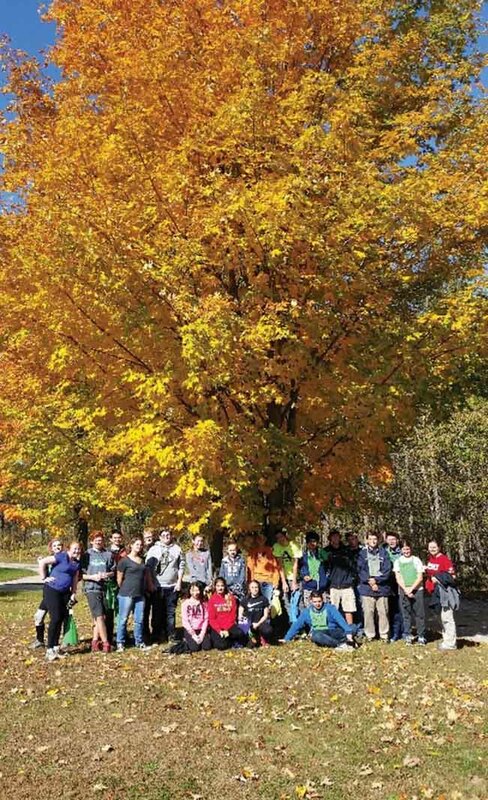 “Fall experiential learning activities” Outdoor Education Programs at Longwoods Road Conservation Area! Mount Brydges – Attention teachers! Book your class for a fall conservation or native studies outdoor program at Longwoods Road Conservation Area and the Ska-Nah-Doht Village and Museum. Hear the autumn calls of the blue jays, the drumming of woodpeckers, the rustling of squirrels and chipmunks and the sounds of school children learning in the great outdoors! Offered year-round, our programming is very popular especially in the fall. Students arrive from as far away as Windsor, Woodstock, Stratford and Sarnia, and as nearby as Delaware and Mount Brydges. From JK, Secondary School, College, University and English as a Second Language classes, students enjoy the outdoor and museum studies at Longwoods. Introducing New Canadians to our heritage and the environment in a natural setting is an experience that cannot be duplicated in the classroom. Learn about Native communities 1,000 years ago on a tour of a longhouse at Ska-Nah-Doht Village, search for creatures at the marsh, or experience a Carolinian forest – all programs are engaging, fun and directly linked to the Ontario Curriculum. Over 25 different Outdoor Education Programs and eight Native Studies Programs are taught by experienced, qualified Conservation Authority staff. We will even bring some programs to your classroom! Several environmental programs are offered in Chatham-Kent at the C.M. Wilson Conservation Area. Visit our website at www.ltvca.ca and check out our Education Program brochures online. Give us a call at 519-264-2420 or email us at info@ltvca.ca to book a field trip. We’d be happy to offer suggestions and tailor programs especially designed for your class! Owned and operated by the Lower Thames Valley Conservation Authority, Longwoods Road Conservation Area’s 155 acres of Carolinian forest, wetlands and ravine systems provide a variety of natural habitats to learn about the environment in the outdoors. Facilities are wheelchair accessible, including the Resource Centre / Museum, Ska-Nah-Doht Village, woodland bridges and boardwalk systems. Two hundred year old heritage log cabins offer unique teaching classrooms and shelter during the lunch time. Many schools enjoy bringing a barbecue lunch to have at the pavilion as a treat for their students. Don’t delay as preferred dates booked quickly! Visit us soon at Longwoods Road Conservation Area and Ska-Nah-Doht Village and Museum. We are located in the Municipality of Strathroy-Caradoc, just 6.5 km west of Delaware (half hour west of London) or 10 km east of Melbourne (one hour east of Chatham) at 8348 Middlesex County 2 (Longwoods Road), just southwest of Mount Brydges. Hope to see you soon!